The California Chamber of Commerce released its list of job creator bills calling attention to the 11 bills that will improve the state’s job climate and stimulate the economy. As proud members of the CalChamber and coalition partners on many issues under the Capitol Dome we are working with them to advance many of the bills that impact the commercial real estate industry. Since 2008, the CalChamber has identified bills that will improve the state’s job climate and stimulate the economy, designating these proposals as job creators. In general, the job creator bills include solutions that will enhance the state’s economy. AB 35 (Chiu; D-San Francisco) Creates Affordable Housing Opportunities. Expands the existing low-income housing tax credit program, making the state better able to leverage an estimated $200 million more in Federal Tax Credits. AB 323 (Olsen; R-Modesto) Expedites and Reduces Cost for Roadway Repair and Maintenance Projects. Streamlines infrastructure development by extending indefinitely the current CEQA exemption for certain roadway repair and maintenance projects. AB 641​ (Mayes; R-Yucca Valley) Expedites and Reduces Cost for Housing Projects. Streamlines and reduces regulatory burdens for the approval and construction of housing developments by providing an expedited review process under the California Environmental Quality Act. AB 52 (Gray; D-Merced) Disability Access Litigation Reform. Seeks to improve access for disabled customers and limit frivolous litigation against businesses for construction-related accessibility claims by providing an opportunity for the businesses to timely resolve any potential violations. AB 54 (Olsen; R-Modesto) Disability Access Litigation Reform. Seeks to improve access for disabled patrons without harming businesses through frivolous lawsuits by providing businesses with a 60-day right to correct the violation for a claim based upon a constructed related accessibility standard that was changed or modified in the prior three years. AB 588 (Grove; R-Bakersfield) Reduces Frivolous Litigation. Seeks to limit frivolous litigation under the Labor Code Private Attorneys General Act, by allowing an employer a 33 day right to cure technical violations on an itemized wage statement that did not cause any injury to the employee. 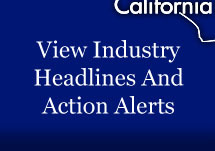 AB 1470 (Alejo; D-Salinas) Reduction of Costly Employment Class Action Litigation. Limits frivolous class action litigation against employers in California who are creating high paying jobs by creating a rebuttable​presumption that employees earning at least $100,000 and performing non-manual labor and at least one exempt duty are exempt from overtime requirements. SB 67 (Galgiani; D-Stockton) Disability Access Litigation Reform. Seeks to limit frivolous litigation against small businesses and those that have sought to comply, by limiting remedies to injunctive relief and expanding the current period to correct any violation from 60 to 120 days. AB 1038 (Jones; R-Santee) Flexible Workweek. Provides employers with the opportunity to accommodate employees’ needs as well as business demands by allowing employees to request a voluntary, flexible workweek agreement that can be repealed by the employee at any time with proper notice. Failed passage in the Assembly Labor and Employment Committee, 04/22/15. Reconsideration Granted.